“Jurassic World” takes place in a future where dinosaur cloning technology has existed for a few decades and the novelty of living dinosaurs has worn off. “Jurassic World” takes place in a future where dinosaur cloning technology has existed for a few decades and the novelty of living dinosaurs has worn off. In real life, we live in a world where the “Jurassic Park” franchise has existed for a few decades and this movie took in $204 million in its opening weekend. We are not yet sick of dinosaurs, and we don’t even have the advantage of them being real. Jurassic World is the dinosaur theme park overseen by the workaholic Claire (Bryce Dallas Howard). Her nephews (Ty Simpkins and Nick Robinson) are visiting the park, but she can’t pull herself away from work to be with them. The park can’t call itself Jurassic Park anymore because of the deaths associated with its former name, though I wouldn’t say it’s enough of a separation; it’s like calling an ocean liner the Titanish. The theme park is actually just a small chunk of a larger dinosaur-inhabited island, the rest is reserved for experimenting with more dangerous dinos. 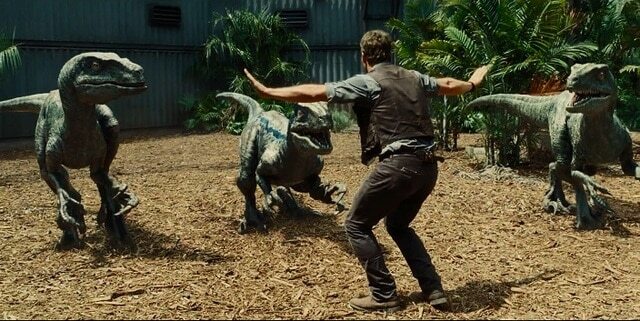 This includes a pack of raptors being trained by Owen (Chris Pratt), whose work is about to be usurped by a military official (Vincent D’Onofrio) who wants to weaponize the cold-blooded killers. Also on the experimental part of the island is the Indominus Rex, the world’s first dinosaur spliced together from the DNA of other animals. Supposedly it looks more terrifying than any of the other dinosaurs, but I thought it looked pretty average for a huge ferocious dinosaur. It’s extremely deadly, but don’t worry, the park’s guests aren’t in danger… unless someone leaves the gate to its pen open. Someone leaves the gate to the pen open and the park’s guests are very much in danger. From here, the audience gets to spend the rest of the movie playing a rousing game of Guess Who Gets Eaten. Rich people, rude people, and people who don’t take their jobs seriously are all likely candidates. Military assassins are going to have the resiliency of crackers, but you know the kids are going to be plucky enough to avoid being snacked upon. Owen is going to last a good long while because he respects the raptors and Claire is going to last because she means well. Our human heroes obviously spend a lot of time on defense, ducking and covering so the dinosaurs can approach them menacingly and then leave them alone, sometimes to pop back up again once they think things are safe. Offensive strategies usually consist of pitting the dinosaurs against each other, which then leaves our heroes with the problem of having new hungry dinosaurs in the mix. It’s a poorly conceived strategy, but at least it gives the movie an excuse to use the raptors and a few others. The movie is lacking in charm. You wouldn’t want to spend time around the human characters. Claire is icy, the kids are annoying, the park’s tech people are sarcastic, and even Owen is less affable than a Chris Pratt action hero ought to be. The dinosaurs, on the other hand, do inspire a connection. Some are cute, some are cool, and one is downright heartbreaking. I wish the film had more confidence in their personalities, because the little we do get makes the film much more tolerable. “Jurassic World” has no delusions that it’s anything other than a dumb summer blockbuster, but it could still afford to be a better dumb summer blockbuster. The jokes could be funnier, the action more exciting, the ravenous dinosaurs more terrifying (not to be confused with the successfully-sympathetic “good” dinosaurs). There’s fun to be had, just not a dinosaur-sized amount. “Jurassic World” is rated PG-13 for intense sequences of science-fiction violence and peril. Its running time is 124 minutes.